We welcome you at the Borda de Mery. Superior category. 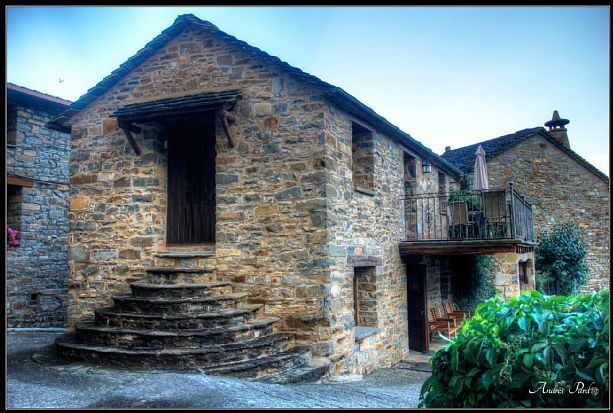 Located in the Valley of La Fueva, 15 minutes from Ainsa and 1 hour from the Ordesa National Park. It was renovated in 2008, has an area of ​​90 m2 including a terrace of 15 m2 and has covered parking, ideal for 2-6 people. It emphasizes its traditional construction, its stone walls, stone slab roof fastened with restored juniper scissors, which are visible from the kitchen-living room. On the upper floor there is a kitchen-living room as well as a bathroom and on the lower floor there is a double single room and a double room. It is ideal for walking through its surrounding forests, doing adventure sports, hiking and enjoying the traditional architecture and cuisine of Sobrarbe. We admit pets, free WIFI. La Borda de Mery consists of two floors - On the top floor - Terrace - Equipped kitchen - Living room. - There is a sofa bed for two people in the living room. - Cleanliness. - The lower floor - Two rooms: one double, one with two single beds. - Complete bathroom - The furniture has been restored, painted and decorated for the occasion. - The ceilings are all made of wood and the stone walls have been painted in the Pompeian style. Es la segunda vez que me alojo en esta casa, la casa perfecta, el entorno maravilloso, ideal para descansar y desconectar, lo único que sigo sin entender son las tijeras de la cocina ? ?, espero poder volver y poder conocer a Mery en persona ya que por circunstancias nunca hemos podido vernos. Casa ideal para 4 personas, con todo lo necesario. Propietarios con una atención excelente. Fue llegar y sentirnos a gusto desde el primer momento, la casa es muy acogedora y el entorno inmejorable. Fuimos dos parejas con nuestras mascotas y disfrutamos muchísimo. La casa estaba impecable, las camas muy comodas, no se le puede sacar una sola pega. Mery fue muy amable desde que llegamos. En nuestro caso repetiremos seguro.